One of the world's most popular and performed living composers, Sir Karl Jenkins is acclaimed for his diverse, innovative and inclusive scores - works rooted in the classical tradition but which draw on ethnic instruments and techniques to striking effect. 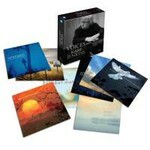 From the award-winning Adiemus to the world premiere recording of The Healer, this special set traces Jenkins's choral career to date, bringing together some of his most celebrated compositions - all of which are united by a harmony of peace guaranteed to appeal to music lovers of all stylistic and spiritual backgrounds. Anyone coming fresh to Karl Jenkins's music today is sure to be amazed by its stylistic range and all-encompassing variety. Music for choirs, orchestras and soloists, for commerce, film and theatre, performed in styles as varied as classical, ecclesiastical, ethnic and jazz-rock. Music that is often erudite but always accessible and welcoming. Such is merely to hint at the musical versatility of Karl Jenkins, or Sir Karl, as he became after his knighthood in June 2015. Karl William Pamp Jenkins - to give him his glorious name in full - was born on the Gower peninsula west of Swansea in 1944. He was taught the rudiments of music by his father, a schoolteacher and chapel choirmaster. Playing the piano from the age of five and then the oboe at Gowerton Grammar School, he joined the National Youth Orchestra of Wales aged 14, later becoming its principal oboist. He was soon attracted to jazz and took up the saxophone. Having studied music at the University of Wales, Cardiff, from 1963 to 1966, he then took a postgraduate course at the Royal Academy of Music in London, thereafter playing with previous acquaintance and jazz musician Graham Collier for a year or so before conforming the groundbreaking jazz-rock group Nucleus (with which he played until 1972). Performing in the unusual role of jazz oboist, he also played with Ronnie Scott's Octet and Keith Tippett's 50-strong Centipede. Throughout most of the 1970s he played with the seminal band Soft Machine, a group that defied categorisation. Such a career would lead one to suppose his future as a jazz musician was secure, but Karl's wide-ranging interests gradually took him away from improvised performance towards notated composition. Initially he headed in the commercial direction of advertising, winning two D&AD Awards for 'best music' with Boots' No.7 range and Levi's 'Russia' series, in particular developing a musical relationship with Sir John Hegarty of the Bartle Bogle Hegarty agency. At the same time, Karl began composing orchestral music for television, the theatre and short films, often working alongside his old Soft Machine colleague, Mike Ratledge. One particular advertisement, for Delta Airlines, suggested a new musical approach, for out of it came a series of extended compositions for voice and orchestra that became the long-running Adiemus project. Adiemus: Songs of Sanctuary (1995) is a collection of song-length pieces featuring harmonised vocals against an orchestral backdrop. Miriam Stockley is the featured singer, chosen both for the beauty of her voice and for her considerable downward range below middle C, and she is joined by Mary Carewe in the louder 'tribal' sections. Both singers' overdubbed vocal lines consist of sung syllables and invented words rather than lyrics that convey a narrative - thus the voice functions purely as an instrument. Accompanying the voices are the strings of the London Philharmonic Orchestra augmented by ethnic percussion instruments. The work has a haunting spirituality that led to someone once describing it as 'spiritual music for secular people'. 'Adiemus' is the future tense of the Latin verb adire ('to approach'), although Jenkins himself has said that he was unaware of this. Perhaps more pertinently, the title suggests two forms of the Latin verb audire ('to hear'): audiemus ('we shall hear') and audiamus ('let us hear'). Whatever the intention, the first Adiemus release was rapturously received, becoming one of the best-selling classical albums of 1995 and spawning five studio successors and four live or compilation sets. The success of Adiemus focused Karl's attention in his succeeding compositions on the use of voices, often massed in a large choir and supported by an orchestra. At the same time, the content of each work became increasingly spiritual. This spirituality is multi-faith, a belief in the divine that is not limited to one particular religion. Such ideas are in tune with many people's own personal beliefs, one reason for the continuing popularity and success of Karl's music. The universality of such beliefs is enhanced by Karl's frequent use of non-Western instruments and musical styles, lifting his music out of any liturgical or historical restriction. For The Armed Man: A Mass for Peace (2001), Karl turned to the Catholic Mass. This specifically anti-war Mass was commissioned by the Royal Armouries Museum to mark both the Millennium and the museum's move from London to Leeds. Interspersed in the Mass are a range of other religious texts drawn from the Islamic call to prayer, the Psalms and the Book of Revelation, and the Mahabharata, as well as words by, among others, John Dryden and Sankichi To¯ge, a Hiroshima survivor. The work tracks the onset and carnage of war, which is concluded by a lone trumpet playing the Last Post, before expressing the hope that peace will endure in the new millennium. Elegiac, austere and undeniably powerful, The Armed Man is one of the major choral works of recent years and is in the regular repertoire of many professional and amateur musicians and choirs. It is the most performed work of the 21st century by a living composer, approaching 2000 performances since its millennium premiere. The spirituality evident in Adiemus becomes even more pronounced in Requiem (2005), a 13-part classical work for orchestra and choir interspersing a Latin Requiem Mass with five Japanese death poems in the form of a haiku. Two of the haiku - 'Having Seen the Moon' and 'Farewell' - combine texts from both sources. Oriental instruments, such as the shakuhachi bamboo flute, are employed in the score. Alongside it on this CD is the four-part In These Stones Horizons Sing, commissioned for the opening of the Welsh Millennium Centre in Cardiff and first performed at this event in November 2004. Bryn Terfel takes the bass-baritone solo. The texts, written by the eminent Welsh poets Grahame Davies, Menna Elfyn and Gwyneth Lewis, are sung in both Welsh and English. Stella natalis (2009), which means 'star of birth', revisits the non-Western influences of Adiemus, drawing on Zulu words, Hindu gods, Old Testament texts and ethnic percussion as part of its Christmas message of peace and goodwill; the libretto is by Karl's wife, Carol Barratt. It is accompanied on this CD by the nine-part Joy to the World, a collection of well-known carols from around the world. Stabat Mater (2008) takes us back to a 13th century Roman Catholic prayer whose full title is Stabat Mater dolorosa ('The sorrowful Mother stood'), a reflection on the suffering of Mary, mother of Jesus, at the Crucifixion. The work is in 12 movements, combining the original 20 verses in six movements with six new movements, including a verse by the 13th-century Persian mystic Rumi and an extract from the ancient Mesopotamian Epic of Gilgamesh. As in Karl's earlier works, Stabat Mater combines both Western orchestra and choir with ethnic instruments and vocals, echoing Adiemus. Lines sung in Aramaic and early Arabic, alongside the use of Middle Eastern percussion, lend local colour to a work that quickly transcends its subject matter. The use of the Roman Catholic liturgy is continued in Gloria (2010), which is based on the 'Gloria' part of the Latin Mass in three movements. Into these are interspersed Psalm 150 in Hebrew and a song derived from Biblical verses in English. Four readings from Hindu, Buddhist, Taoist and Muslim texts that explore how other religions perceive the Divine complete this heartfelt, ninepart work. A five-part Te Deum concludes the CD. The ethos of The Peacemakers (2011) is summed up in a line by Rumi: 'All religions, all singing one song; Peace be with you'. The work takes words from a wide variety of peacemakers and different religious texts from around the world, and accompanies them with complementary music: temple bells for the Dalai Lama, for example, and African percussion for Nelson Mandela. Cast in two parts and with a heartfelt violin intermezzo by Chloë Hanslip, it is performed by a symphony orchestra with two choirs (adult and children), plus a soprano and instrumental soloists. Two movements - 'Fiat pax in virtute tua' and 'Anthem: Peace, triumphant peace' - feature The Really Big Chorus, a huge congregation of 1000 voices, recorded in five shifts of 200 choristers at a time at Abbey Road Studios. As with previous works, The Peacemakers mixes Western church and classical music with ethnic elements, notably in the percussion, to powerful effect. Finally, this box set ends with a new work. The Healer: A Cantata for St Luke was written to mark the 10th anniversary of Grayshott Concerts, whose aim is to provide top-quality classical music performances for the people of Grayshott on the Hampshire/Surrey borders. It was first performed at St Luke's Church, Grayshott, in October 2014. St Luke was also known as 'The Physician', so this whole work concerns healing, spiritual as well as secular, as in the healing of our planet. The libretto includes parts of St Luke's Gospel and the Collect for the Feast of St Luke, as well as a poem by William Blake and new texts by Carol Barratt, Terry Waite and Vivien Harrison, co-founder, with her husband Peter, of Grayshott Concerts. The Healer is scored for a small ensemble, consisting of soprano, baritone, mixed chorus, oboe, strings and percussion, including two Middle Eastern instruments: the riq, a type of tambourine, and the darabuca, a goblet drum, played with the hands. The eight CDs that make up this collection are a glorious celebration of the human voice for which Karl writes so beautifully. Bryn Terfel has said that Karl always produces 'impeccable writing for a multitude of voices and instruments', a skill that in some surveys has made him the most-performed living composer in the world. He is also probably the most popular, for his musical and spiritual vision knows no boundaries and is welcomed by so many.